Life is full of lessons. As long as you’re open to learning, you never stop being a student. I’ve learned some important lessons about Christmas giving from my wife, the Elusive. 1) Clothes are a nice gift. Especially if she’s there when you pick them out. One day I had a revelation. I noticed a shirt hanging on my wife’s side of the closet that I’d given her for Christmas that I’d never seen her wear. Beside were 3 other shirts and one sweater with the very same story. When I asked her about them she said, “I’m saving them for a special occasion.” As special as Judgment Day, apparently. These were never coming out of the closet. I realized taking her shopping – shopping with her – picking things out and watching her try things on – this was not only a safer route to seeing the clothes on her but the time together was as meaningful as the gifts themselves. 3) Lingerie. See #1 & #2 above. 4) Thought. My wife, the Elusive, can be happy – thrilled even! – with the simplest and most inexpensive of gifts as long as they reveal that thought went into them. Similarly, something pricey that has no connection to her likes, her story, her personality is worse than worthless because it’s like insult to injury, “You paid how much for this? And you thought I would like it why?” She’s the Queen of Christmas Socks. She will fill each family members stocking with good things but not just good things. Each item will have significance and meaning – a favourite candy unique to their tastes, a small toy or plaything from their childhood, a matchbox car that’s make, model or decoration is distinctively suited for the recipient. It’s almost like a superpower. 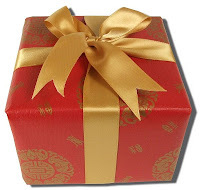 5) Receiving is nice, Giving is better. If someone wanted to torture my wife they would make a rule that she could receive gifts but not give them. It’s not that she doesn’t enjoy a thoughtful or creative gift given in love. It’s not that the kindness of others and their generosity does not touch her, they do. But what truly lights her up, makes that inner luminosity shine in her eyes and radiate from her face, is giving a gift to someone and watching them receive it and connect with the heart behind it. She’s most satisfied when she sees the recognition on someone’s face as they open their gift and realize the meaning or significance – how this gift connects uniquely with them. My Elusive wife has taught me that giving can be its own reward. And seeing her in action again this Christmas I am truly grateful that God saw what I needed and delivered a present to me in a very attractive container that truly keeps on giving. If you’d like to help me reach my goal of a Masters Degree, you can click the link =è to donate or follow the FYI instructions if you’re in Canada and would like a Tax Receipt for your donation!